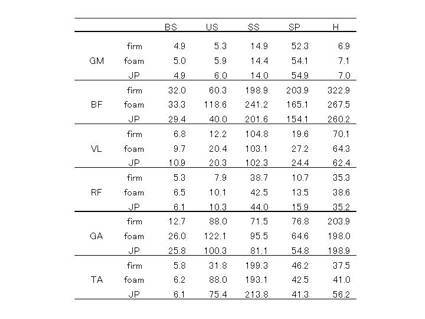 JP-cushion is an exercise material that provides unstable, compliant support surface as well as foam. Additionally, JP-cushion has distinctive moderate elasticity. This study was conducted to test two following hypotheses. 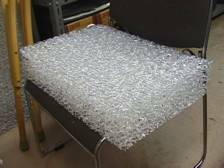 First, use of JP-cushion induces over-load into neuromuscular system during exercises as well as use of foam surface. Second hypothesis is that use of JP-cushion adds the feeling of fun and reduces subjective load during exercises. Eighteen healthy male subjects participated in this study. Root-mean-square electromyography (EMG) amplitudes from the tibialis anterior, gastrocnemius, rectus femoris, vastus lateralis, biceps femoris and gluteal maximus muscles were measured during bi-pedal stance, uni-pedal stance, single-leg-squat, stepping-in-place and hopping, all performed on firm surface, foam surface and JP-cushion. Questioners were conducted to analyze exercise-induced feeling states of each task except for bi-pedal and uni-pedal stance. EMG activities and exercise-induced feeling states were compared between three surfaces. Broadly, results of EMG analysis showed that use of JP-cushion increased EMG activities during exercises as well as use of foam surface. Therefore, the first hypothesis was supported. The analysis of exercise-induced feeling states revealed that use of JP-cushion could make additional fun, in particular during hopping. The differences between subjective load during exercises with and without JP-cushion were not significant. Despite the increments of neuromuscular load during exercises with JP-cushion, subjects performed exercises with the subjective load equal to on firm surface. Hence, the second hypothesis was also supported. These results suggest that JP-cushion is an effective material of increasing neuromuscular load and fun of exercises. 1) Anderson, K., Behm, D. G. (2005). The impact of instability resistance training on balance and stability. Sports Med, 35(1), 43-53. 2) Bellew, J. W., Fenter, P. C., Moore, R., Loreno, D. (2005). Effects of short-term dynamic balance training program in healthy older women. J Geriatr Phys Ther, 28(1), 4-8. 3) Blackburn, J. T., Hirth, C. J., Guskiewicz, K. M. (2003). Exercise Sandals increase lower extremity electromyographic activity during functional activities. J Athl Train, 38(3), 198-203. 4) Bahr, R. (2001). Sports medicine: Clinical review. BMJ, 323, 328-331. 5) Dietz, V., Faist, M., Pierrot-Deseulligny, E. (1990). Amplitude modulation of quadriceps H-reflex in the human during the early stance phase of gait. Exp Brain Res, 79, 221-224. 6) Farley, C. T., Houdijk, H. H. P., Strien, C. V., Louie, M. (1998). Mechanism of leg stiffness adjustment for hopping on surface of different stiffnesses. J Appl Physiol, 85(3), 1044-1055. 7) Ferris, D. P., Farley, C. T. (1997). Interaction of leg stiffness and surface stiffness during human hopping. J Appl Physiol, 82(1), 15-22. 8) Ferris, D.P., Louie, M., Farley, C.T. (1999). Runners adjust leg stiffness for their first step on a new running surface. J Biomech, 32, 787-794. 9) Farley, C, T., Morgenroth D. C. (1999). Leg stiffness primarily depends on ankle stiffness during human hopping. J Biomech, 32,267-273. 10) Hasegawa, I. (2005). The use of unstable training for enhancing sport performance. NSCA’s Performance Training Journal, 4(4), 15-17. 11) 長谷川聖修 (2000). 動く楽しさを追求する体ほぐし　体育科教育別冊18, 大修館書店, 149-150. 12) 長谷川聖修(2004). なぜ今Gボールか！？その意味と可能性を探る　こどもと体育, 128, 光文書店, 23-26. 13) Haynes, W. (2004). Core stability and the unstable platform device. J Bodywork Mov Ther, 8, 88-103. 15) Hof, A. L., Nautaa, J., VanderKnaap, E. R., Schalliga, M. A. A. and Struwea, D. P. (1993). Calf muscle work and segment energy changes in human treadmill walking. J Electromyography Kinesiol, 2(4), 203-216. 16) 飯島裕美, 鈴木寛康, 木塚朝博 (2006). 幼児における弾性動揺体を用いた連続ジャンプの向上要因の検討　日本体育学会第57回大会予稿集, 163. 17) Ishihara, K., Ueda, T., Nishimoto, K., Mimura, T., Tanaka, S., Fujimoto, S. (2004). Balance Pad Exercise may Attenuate Falling Risks in Geriatric Health Services Facility Residents. Med Sci Sports Exercise, 36(5), Suppl, S182. 18) 板垣了平 (1990). 体操論, アイオーエム, 261-265. 19) 板谷厚, 深瀬友香子, 鞠子佳香, 長谷川聖修 (2004). 立体網状構造体を用いた運動の特性とプログラム試案　日本体操学会第４回大会号, 40-41. 20) Kepple, T. M., Siegel, L. K., Stanhope, S. J. (1997). Relative contributions of lower extremity joint moments to forward progression and support during gait. Gait Posture, 6, 1-8. 21) 木塚朝博, 鈴木寛康, 飯島裕美, 長谷川聖修 (2006). 弾性動揺体を用いた新しい幼児用運動能力テストの試案　日本体育学会第57回大会予稿集, 162. 22) Load, S. R., Menz, H. B. (2000). Visual contributions to postural stability in older adults. Gerontology, 46, 306-310. 23) Mattacola, C. G., Dwyer, M. K. (2002). Rehabilitation of the ankle after acute sprain or chronic instability. J Athl Train, 37(4), 413-429. 25) Myer, G. D., Ford, K. R., Paulumbo, J. P., Hewett, T. E. (2005). Neuromuscular training improves performance and lower-extremity biomechanics in female athletes. J Strength Cond Res, 19(1), 51-60. 26) Neptune, R. R., Kautz, S. A., Zajac, F. E. (2001). Contributions of the individual ankle planter flexors to support forward progression and swing initiation during walking. J Biomech, 34, 1387-1398. 27) Norris, C. M. (1995). An Exercise program to enhance lumbar stabilization. Physiotherapy, 81(3), 138-146. 28) Page, P. (2006). Sensorymotor training: A “global” approach for balance training. J Bodywork Mov Ther, 10, 77-84. 29) Petersen, W., Braun, C., Bock, W., Schmidt, K., Weimann, A., Drescher, W., Eiling, E., Stange, R., Fuchs, T., Hedderich, J., Zantop, T. (2005). A controlled prospective case control study of a prevention training program in female team handball players: the German experience. Arch of Orthop Trauma Surg, 125, 614-621. 30) Riemann, B. L., Myers, J. B., Lephart, S. M. (2003). Comparison of the ankle, knee, hip, and trunk corrective action show during single-leg stance on firm, foam, and multiaxial surfaces. Arch Phys Med Rehabil, 84, 90-95. 31) Shumway-Cook, A., Horak, F. (1986). Assessing the influence of sensory interaction on balance. Phys Ther, 66, 1548-1550. 32) 鈴木寛康, 木塚朝博, 飯島裕美, 長谷川聖修, 衣笠隆(2006). 弾性動揺体を用いた運動が幼児の調整力に与える効果　日本体育学会第57回大会予稿集, 162. 33) Verhagen, E., Beek, A., Twisk, J., Bouter, L., Bahr, R., Mechelen, W. (2003). The Effect of Proprioceptive Balance Board Training Program for the Prevention of Ankle Sprains: A Prospective Controlled Trial. Am J of Sports Med, 32(6), 1385-1393.